Posted by Jon in DC, Funko, Review with 0 comments. 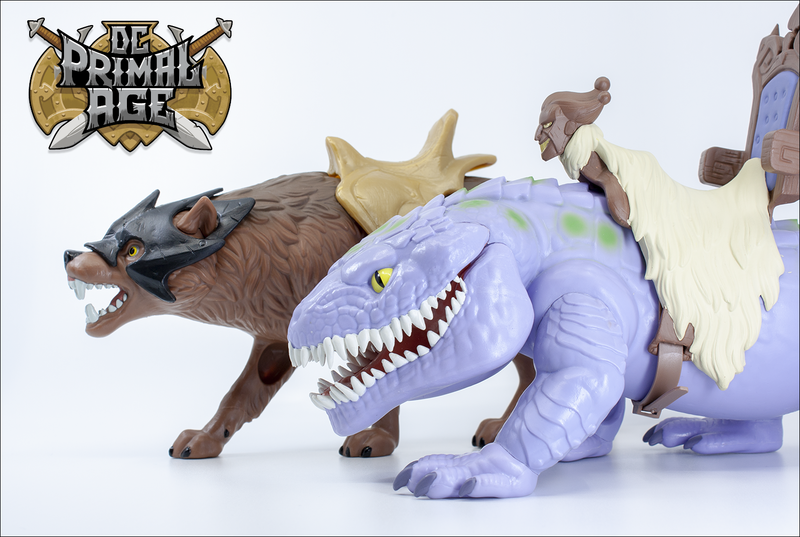 As if Funko’s new DC Primal Age series with eight 5.5-inch figures and a giant Batcave playset wasn’t enough, the collection also includes two beasts for the main characters to ride! Keeping with the theme of being Masters of the Universe adjace, Batman (who would be He-Man) and Joker (Skeletor) get their own beastly mounts. Ace the Bathound gets the honor of being the Battle Cat, while the role of Panthor will be played by The Joker Beast. Really Funko? “The Joker Beast” was the best name you could come up with for a bitchin’ giant purple lizard? Name aside, I’ll take it. I think that one thing Masters of the Universe really robbed us on were lizards, reptiles, dinosaurs, and the like. The Powers of Greyskull line held so much potential before its untimely death. At least we got Tyrantisaurus Rex, Turbodactyl, and Bionatops before everything else got scrapped. What was I getting at again? Oh yes, The Joker Beast has an awesome look, and if I still had my vintage MOTU figures, they would totally jack the Joker’s ride. I think Ace the Bathound got the short end of the creativity stick in this set. There is a ton of personality and fun put into the sculpting of the lizard, but the wolf is just kind of there. He’s not a bad toy, it’s just that he’s very plain. Both of these fine beasts do not have any articulation, similar to their vintage Masters of the Universe toy counterparts. They do sit pretty flush to the ground, so I wouldn’t worry too much about balance. Their saddles are removable if you wish. In addition to that, Ace the Bathound’s helmet comes off. The DC Primal Age figures are Amazon exclusives. Ace and Joker Beast will run you between $20 to $25 each and are currently available at this link.